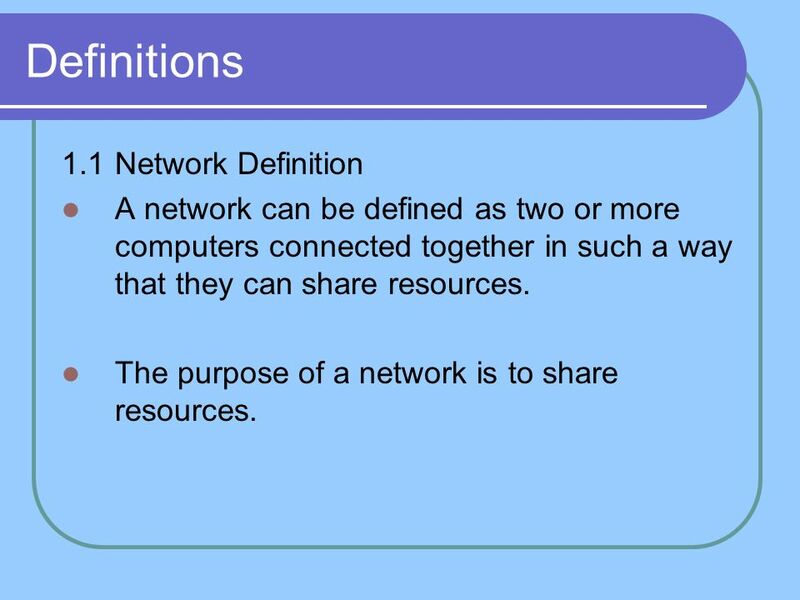 A network can be defined as two or more computers connected together in such a way that they can share resources. The purpose of a network is to share resources. A disk drive Or just about anything else that exists on a computer. 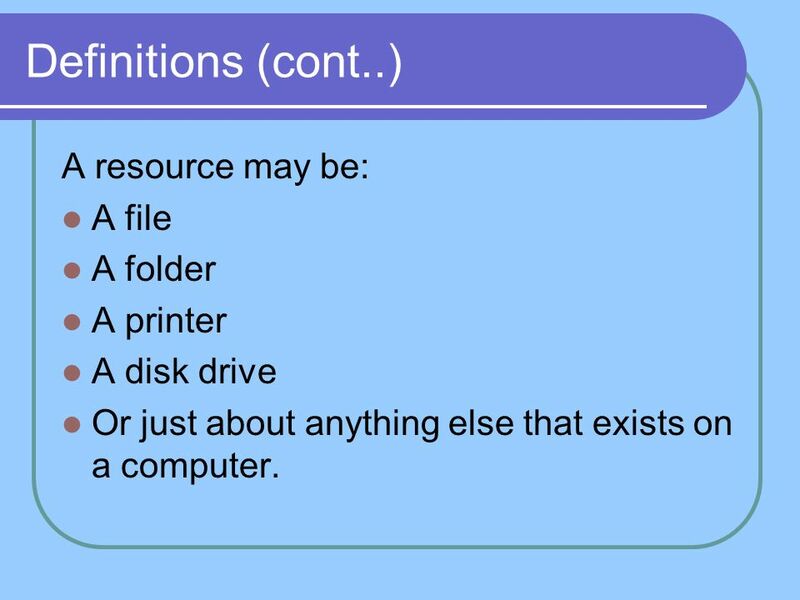 4 Definitions (cont..) A network is simply a collection of computers or other hardware devices that are connected together, either physically or logically, using special hardware and software, to allow them to exchange information and cooperate. Networking is the term that describes the processes involved in designing, implementing, upgrading, managing and otherwise working with networks and network technologies. 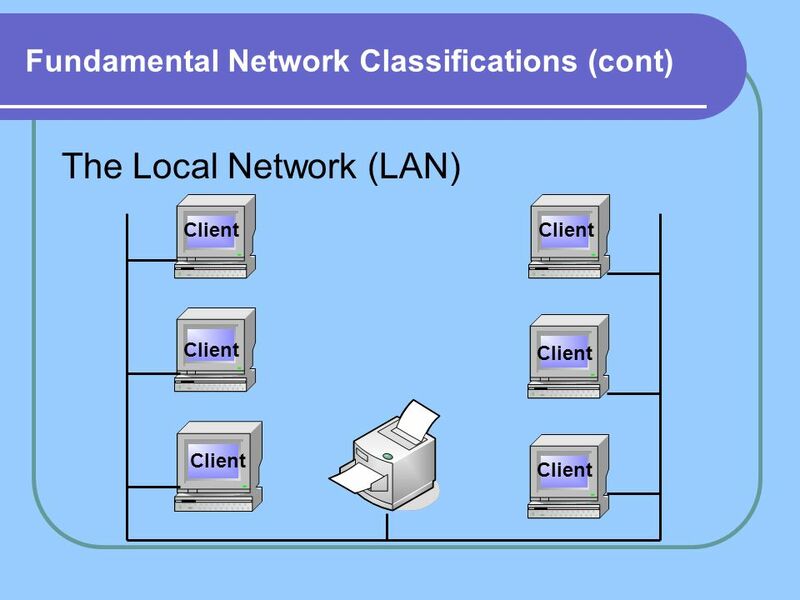 Local Area Networks (LANs): A local area network (LAN) is a computer network covering a small geographic area, like a home, office, or group of buildings Wide Area Networks (WANs): Wide Area Network (WAN) is a computer network that covers a broad area (i.e., any network whose communications links cross metropolitan, regional, or national boundaries). Or, less formally, a network that uses routers and public communications links The largest and most well-known example of a WAN is the Internet. 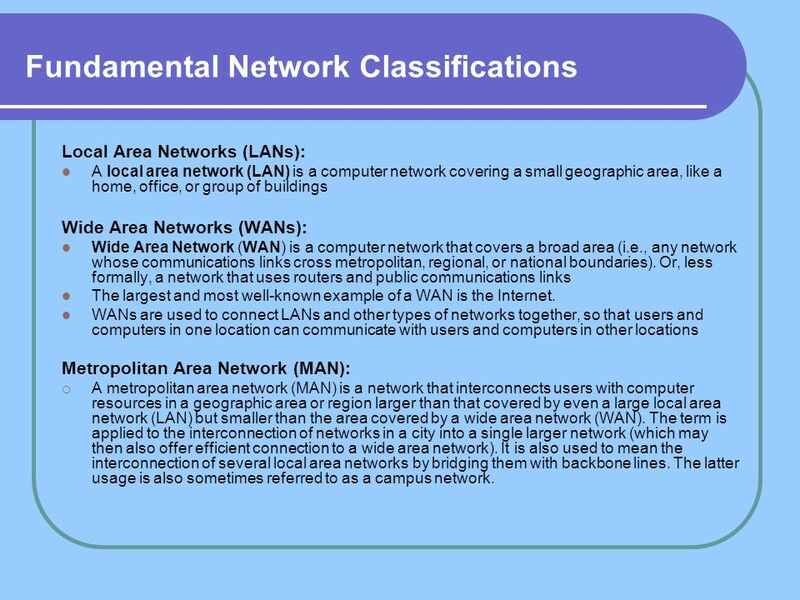 WANs are used to connect LANs and other types of networks together, so that users and computers in one location can communicate with users and computers in other locations Metropolitan Area Network (MAN): A metropolitan area network (MAN) is a network that interconnects users with computer resources in a geographic area or region larger than that covered by even a large local area network (LAN) but smaller than the area covered by a wide area network (WAN). 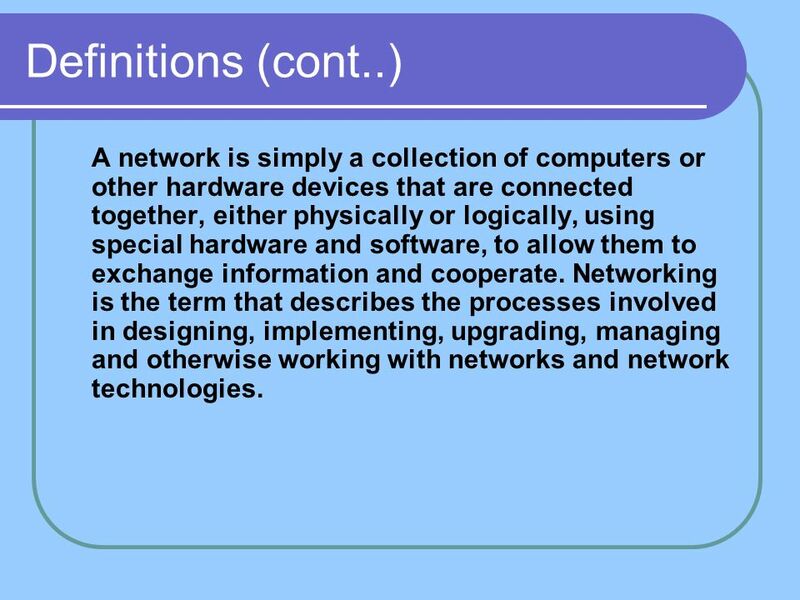 The term is applied to the interconnection of networks in a city into a single larger network (which may then also offer efficient connection to a wide area network). It is also used to mean the interconnection of several local area networks by bridging them with backbone lines. The latter usage is also sometimes referred to as a campus network. Intranet: An intranet is a private network that is contained within an enterprise. It may consist of many interlinked local area networks and also use leased lines in the wide area network. 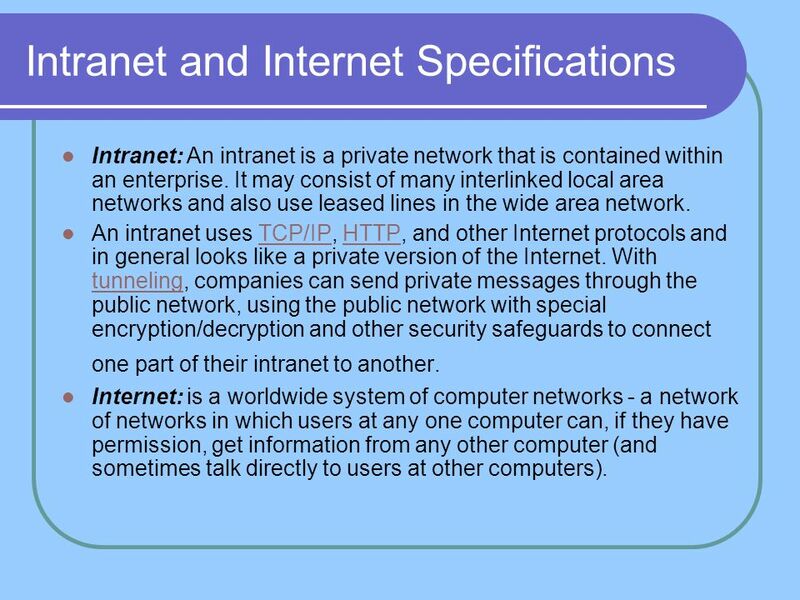 An intranet uses TCP/IP, HTTP, and other Internet protocols and in general looks like a private version of the Internet. With tunneling, companies can send private messages through the public network, using the public network with special encryption/decryption and other security safeguards to connect one part of their intranet to another. Internet: is a worldwide system of computer networks - a network of networks in which users at any one computer can, if they have permission, get information from any other computer (and sometimes talk directly to users at other computers). 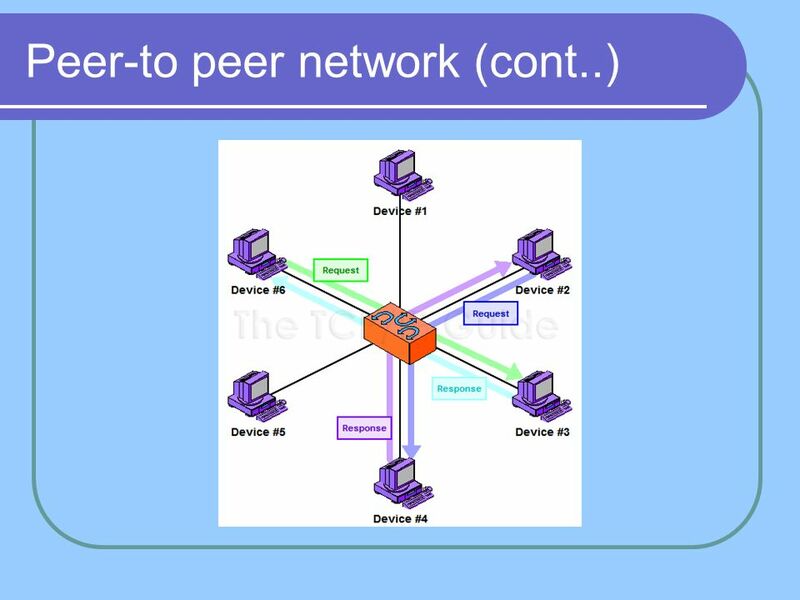 13 Peer-to peer network A peer-to-peer network is a network where the computers act as both workstations and servers. great for small, simple, and inexpensive networks. 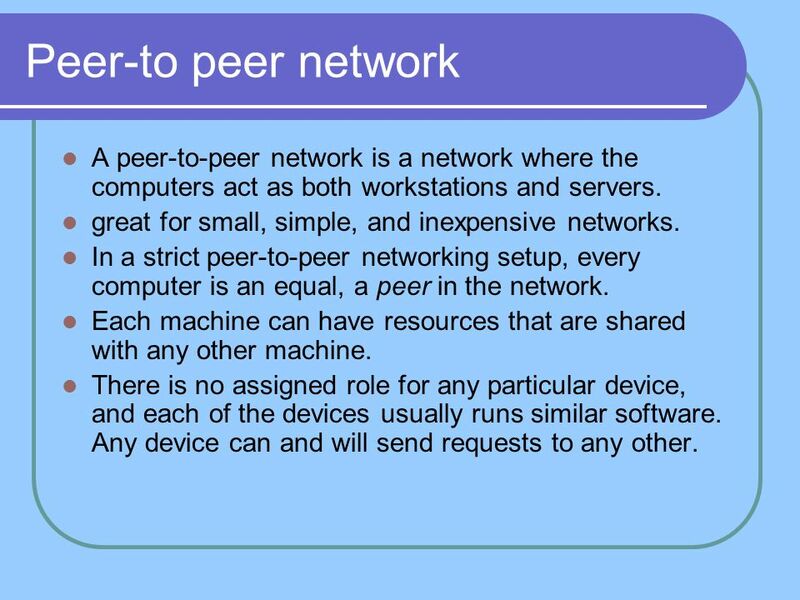 In a strict peer-to-peer networking setup, every computer is an equal, a peer in the network. Each machine can have resources that are shared with any other machine. 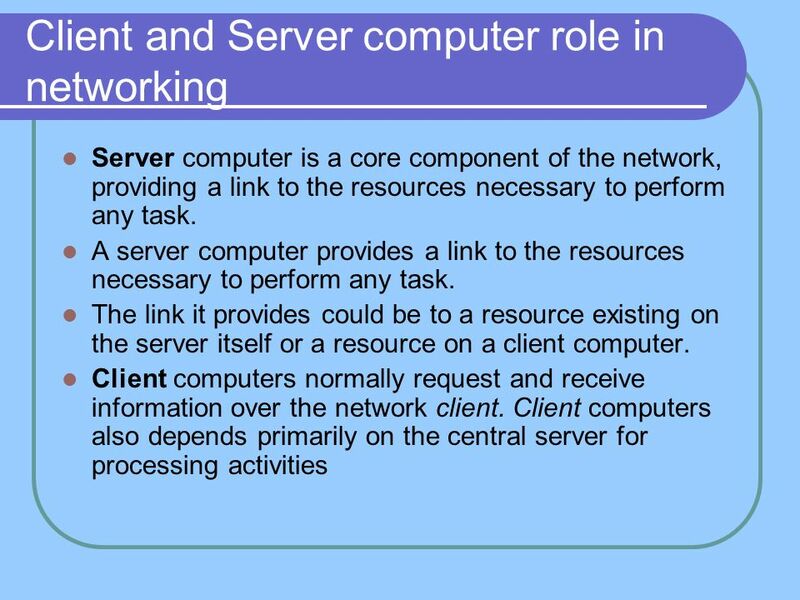 There is no assigned role for any particular device, and each of the devices usually runs similar software. Any device can and will send requests to any other. 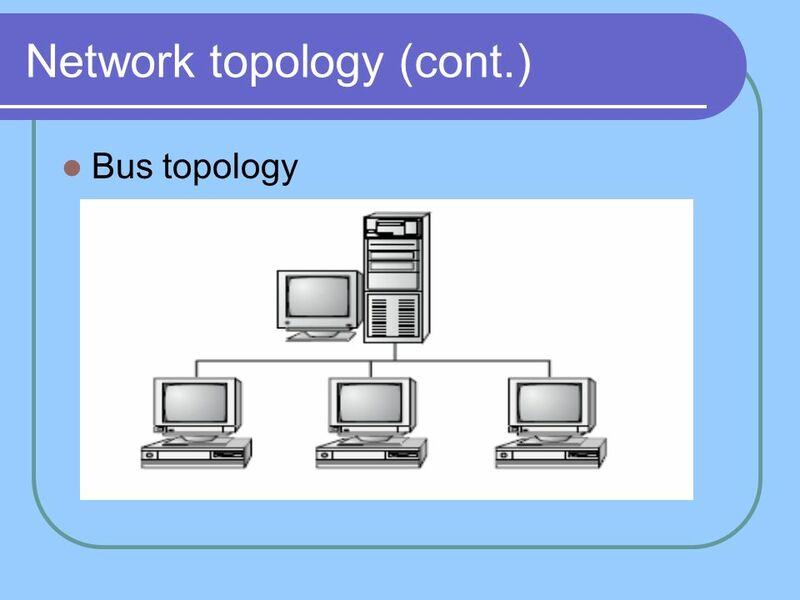 Bus A bus is the simplest physical topology. It consists of a single cable that runs to every workstation This topology uses the least amount of cabling, but also covers the shortest amount of distance. Each computer shares the same data and address path. With a logical bus topology, messages pass through the trunk, and each workstation checks to see if the message is addressed to itself. If the address of the message matches the workstation’s address, the network adapter copies the message to the card’s on-board memory. it is difficult to add a workstation have to completely reroute the cable and possibly run two additional lengths of it. if any one of the cables breaks, the entire network is disrupted. Therefore, it is very expensive to maintain. 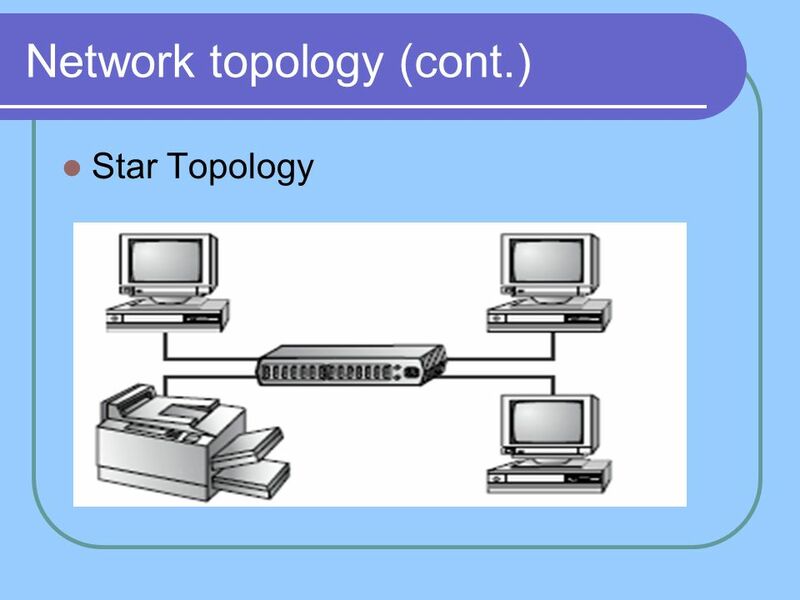 Star Topology A physical star topology branches each network device off a central device called a hub, making it very easy to add a new workstation. Also, if any workstation goes down it does not affect the entire network. (But, as you might expect, if the central device goes down, the entire network goes down.) 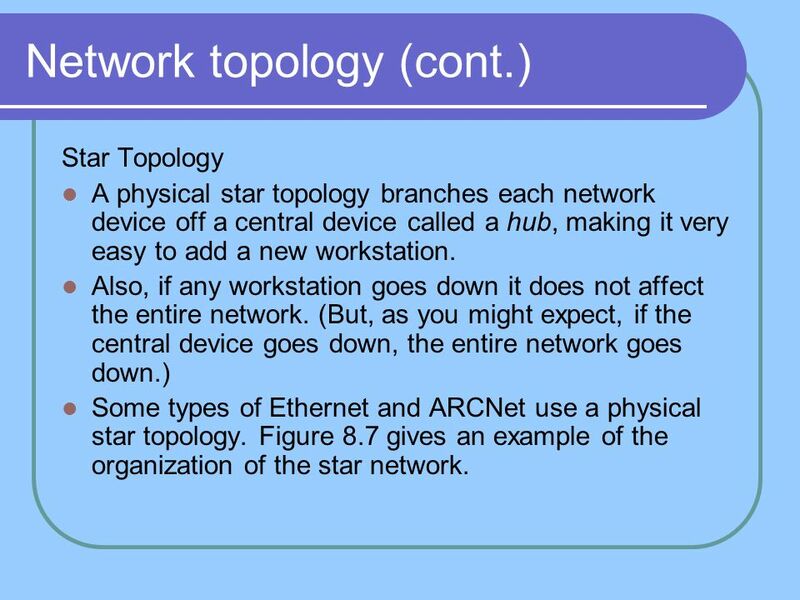 Some types of Ethernet and ARCNet use a physical star topology. Figure 8.7 gives an example of the organization of the star network. Star topologies are easy to install. A cable is run from each workstation to the hub. The hub is placed in a central location in the office. 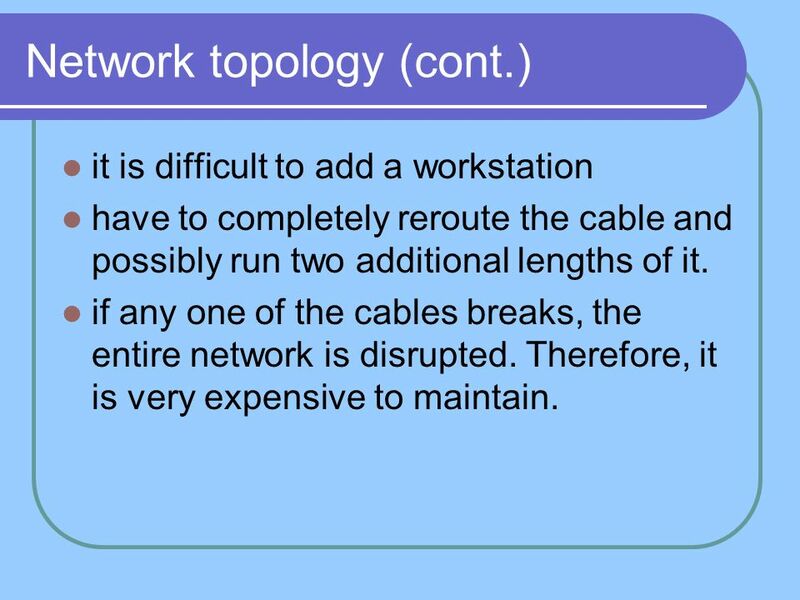 Star topologies are more expensive to install than bus networks, because there are several more cables that need to be installed, plus the cost of the hubs that are needed. Ring Each computer connects to two other computers, joining them in a circle creating a unidirectional path where messages move workstation to workstation. Each entity participating in the ring reads a message, then regenerates it and hands it to its neighbor on a different network cable. The ring makes it difficult to add new computers. 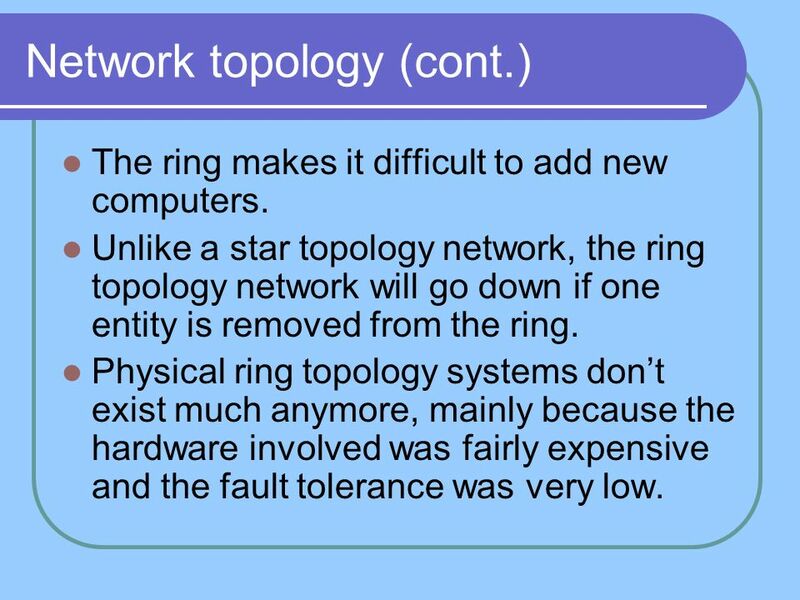 Unlike a star topology network, the ring topology network will go down if one entity is removed from the ring. Physical ring topology systems don’t exist much anymore, mainly because the hardware involved was fairly expensive and the fault tolerance was very low. 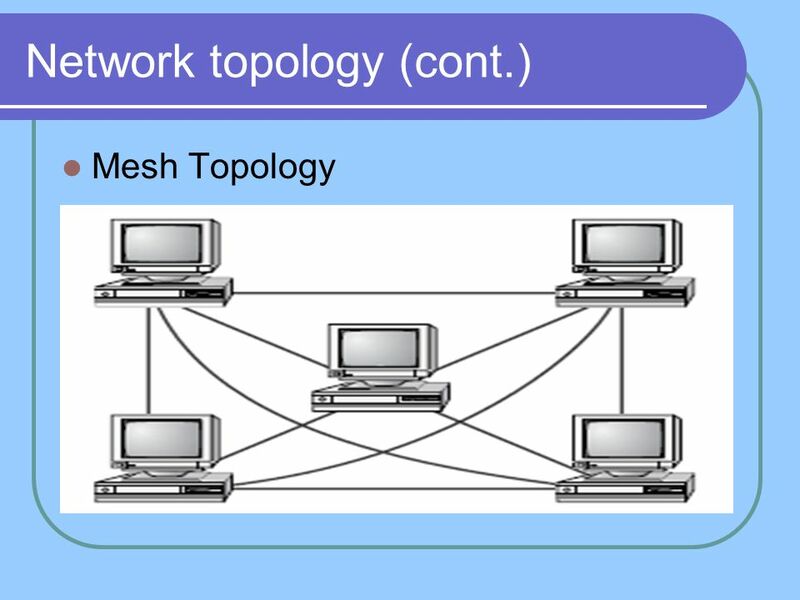 Mesh The mesh topology is the simplest logical topology in terms of data flow, but it is the most complex in terms of physical design. 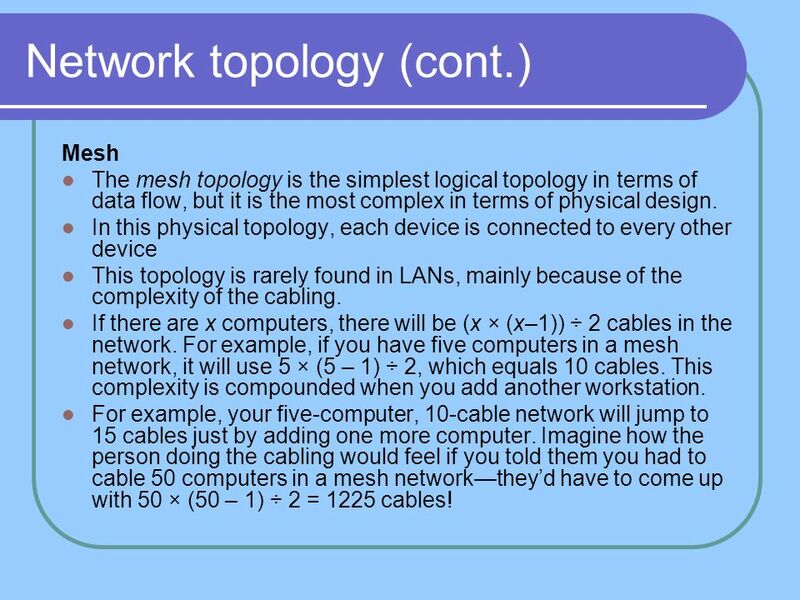 In this physical topology, each device is connected to every other device This topology is rarely found in LANs, mainly because of the complexity of the cabling. If there are x computers, there will be (x × (x–1)) ÷ 2 cables in the network. For example, if you have five computers in a mesh network, it will use 5 × (5 – 1) ÷ 2, which equals 10 cables. This complexity is compounded when you add another workstation. For example, your five-computer, 10-cable network will jump to 15 cables just by adding one more computer. Imagine how the person doing the cabling would feel if you told them you had to cable 50 computers in a mesh network—they’d have to come up with 50 × (50 – 1) ÷ 2 = 1225 cables! Because of its design, the physical mesh topology is very expensive to install and maintain. Cables must be run from each device to every other device. The advantage you gain from it is its high fault tolerance. 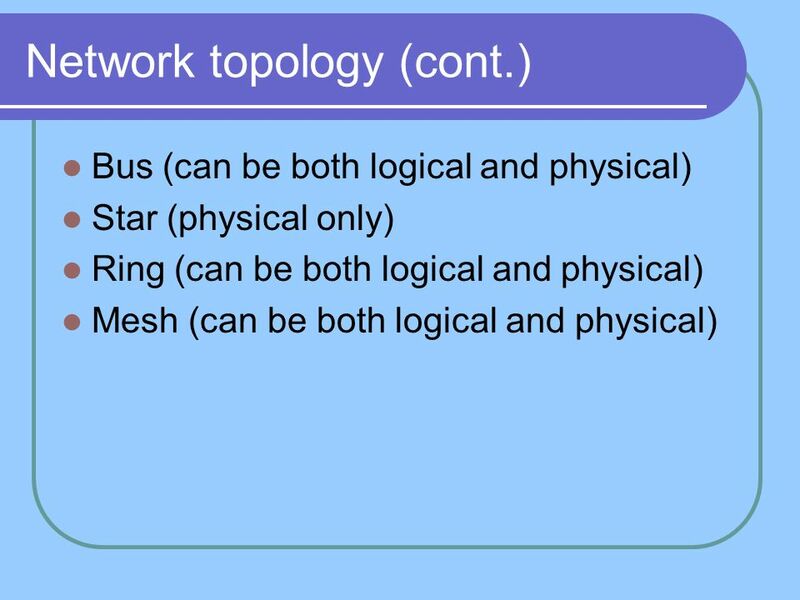 With a logical mesh topology, however, there will always be a way of getting the data from source to destination. It may not be able to take the direct route, but it can take an alternate, indirect route. 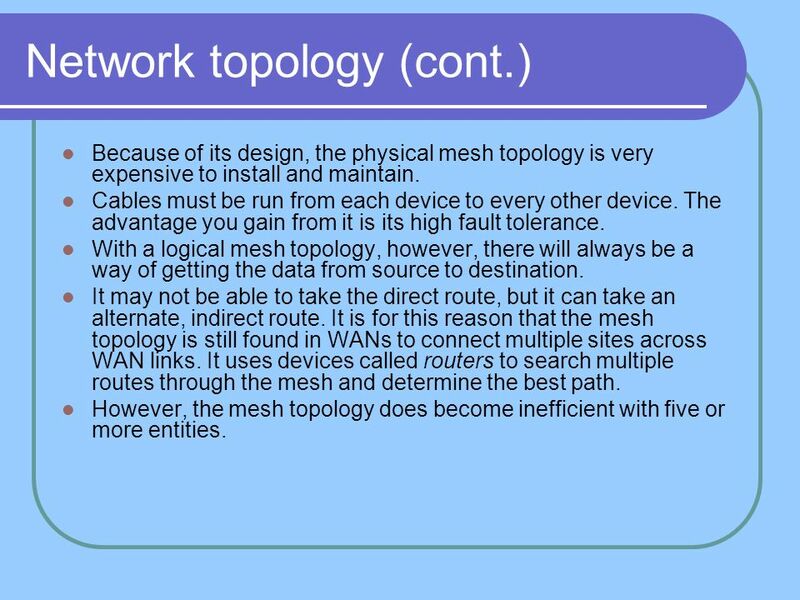 It is for this reason that the mesh topology is still found in WANs to connect multiple sites across WAN links. It uses devices called routers to search multiple routes through the mesh and determine the best path. However, the mesh topology does become inefficient with five or more entities. Advantages and Disadvantages of Network Topologies Topology Advantages Disadvantages Bus Cheap. Easy to install. Difficult to reconfigure. Break in bus disables entire network. Star Easy to reconfigure. Fault tolerant. More expensive than bus. Ring Efficient. Easy to install. Reconfiguration difficult. Very expensive. Mesh Simplest. Most fault tolerant. Reconfiguration extremely difficult. Extremely expensive. Very complex. In the computer, data moves along buses in parallel, as on a four-lane interstate highway. 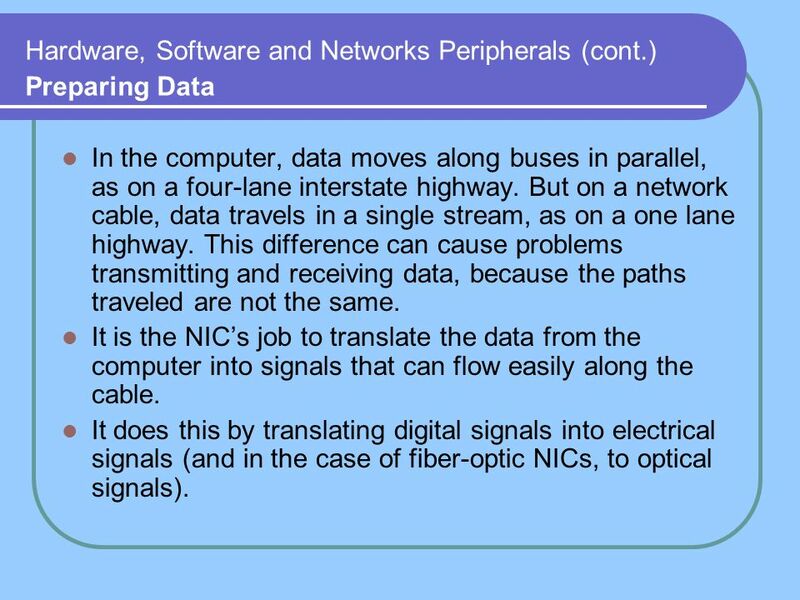 But on a network cable, data travels in a single stream, as on a one lane highway. This difference can cause problems transmitting and receiving data, because the paths traveled are not the same. 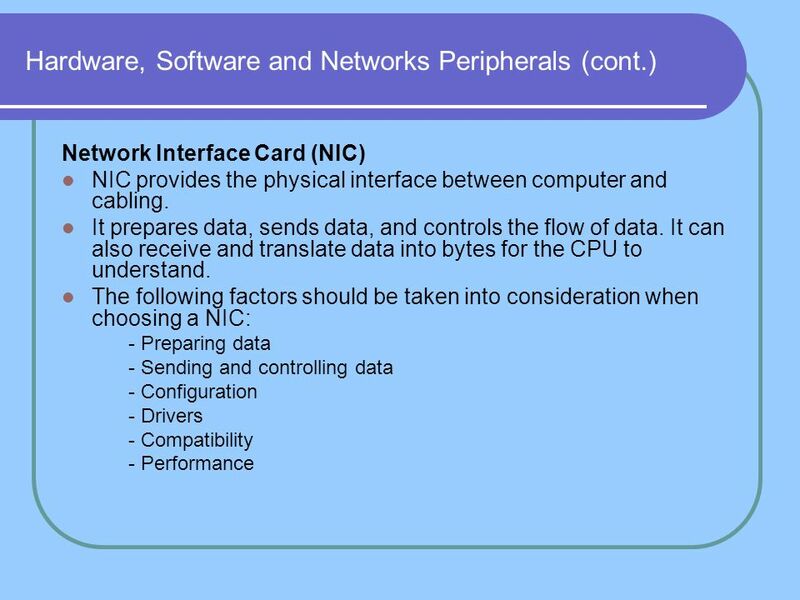 It is the NIC’s job to translate the data from the computer into signals that can flow easily along the cable. It does this by translating digital signals into electrical signals (and in the case of fiber-optic NICs, to optical signals). 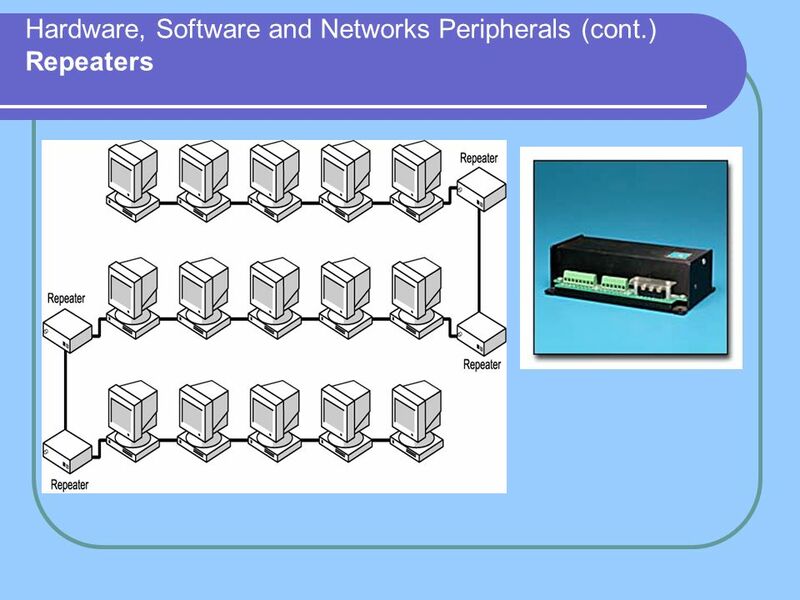 Hardware, Software and Networks Peripherals (cont.) 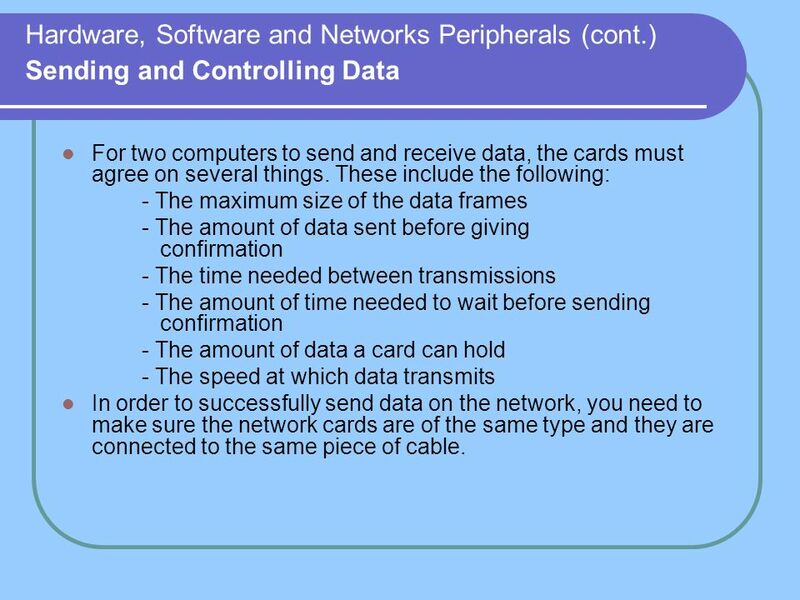 Sending and Controlling Data For two computers to send and receive data, the cards must agree on several things. These include the following: - The maximum size of the data frames - The amount of data sent before giving confirmation - The time needed between transmissions - The amount of time needed to wait before sending confirmation - The amount of data a card can hold - The speed at which data transmits In order to successfully send data on the network, you need to make sure the network cards are of the same type and they are connected to the same piece of cable. 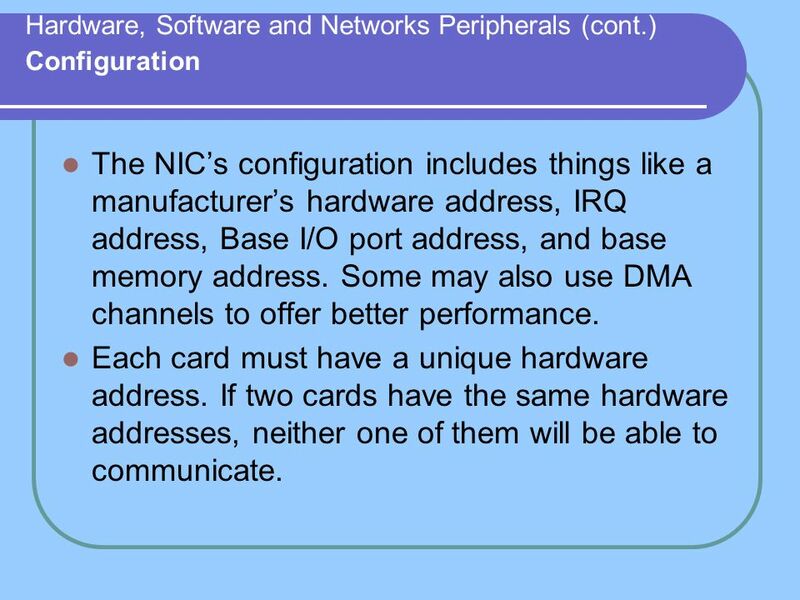 The NIC’s configuration includes things like a manufacturer’s hardware address, IRQ address, Base I/O port address, and base memory address. Some may also use DMA channels to offer better performance. Each card must have a unique hardware address. If two cards have the same hardware addresses, neither one of them will be able to communicate. 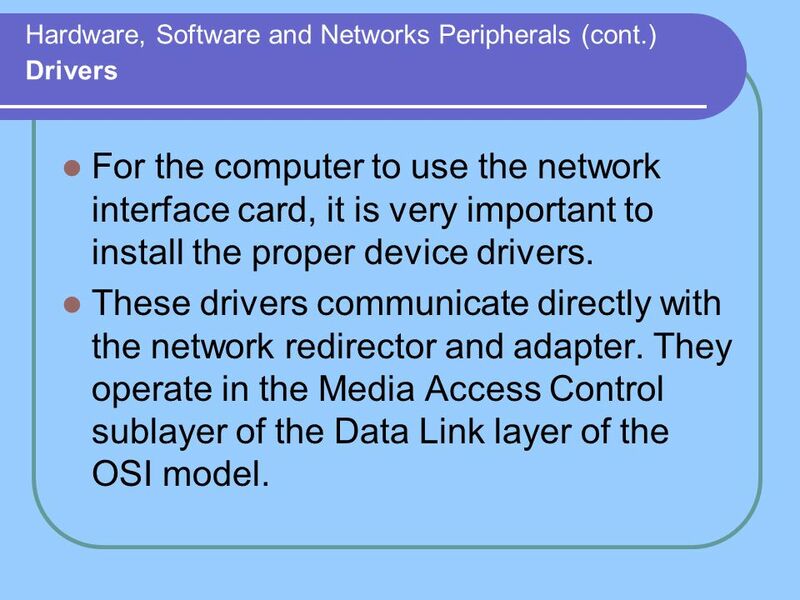 For the computer to use the network interface card, it is very important to install the proper device drivers. These drivers communicate directly with the network redirector and adapter. They operate in the Media Access Control sublayer of the Data Link layer of the OSI model. When choosing a NIC, use one that fits the bus type of your PC. 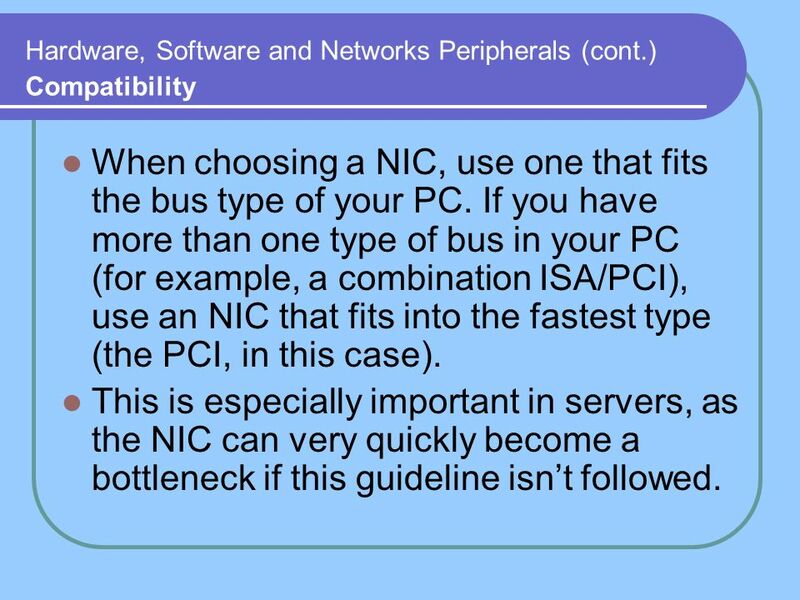 If you have more than one type of bus in your PC (for example, a combination ISA/PCI), use an NIC that fits into the fastest type (the PCI, in this case). This is especially important in servers, as the NIC can very quickly become a bottleneck if this guideline isn’t followed. The most important goal of the network adapter card is to optimize network performance and minimize the amount of time needed to transfer data packets across the network. There are several ways of doing this, including assigning a DMA channel, use of a shared memory adapter, and deciding to allow bus mastering. 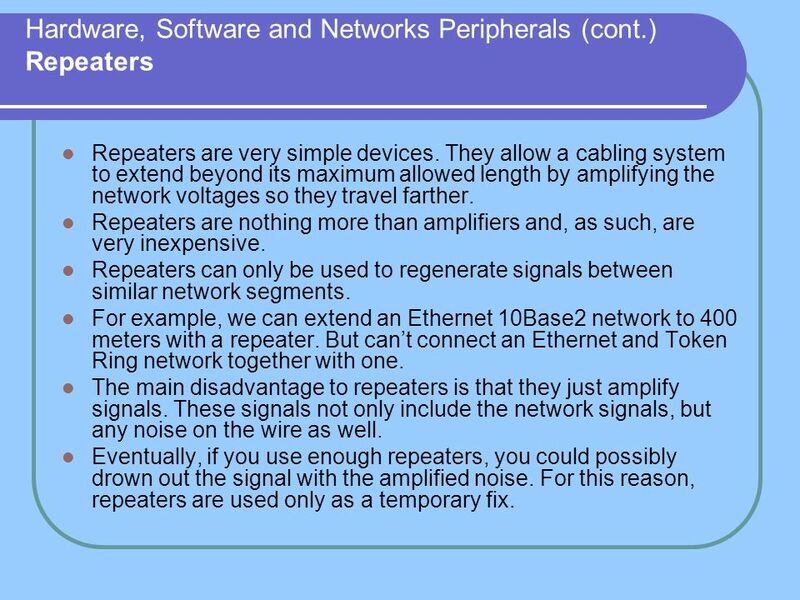 Repeaters are very simple devices. They allow a cabling system to extend beyond its maximum allowed length by amplifying the network voltages so they travel farther. Repeaters are nothing more than amplifiers and, as such, are very inexpensive. Repeaters can only be used to regenerate signals between similar network segments. For example, we can extend an Ethernet 10Base2 network to 400 meters with a repeater. But can’t connect an Ethernet and Token Ring network together with one. The main disadvantage to repeaters is that they just amplify signals. These signals not only include the network signals, but any noise on the wire as well. Eventually, if you use enough repeaters, you could possibly drown out the signal with the amplified noise. For this reason, repeaters are used only as a temporary fix. Hubs are devices used to link several computers together. They repeat any signal that comes in on one port and copy it to the other ports (a process that is also called broadcasting). There are two types of hubs: active and passive. Passive hubs simply connect all ports together electrically and are usually not powered. Active hubs use electronics to amplify and clean up the signal before it is broadcast to the other ports. 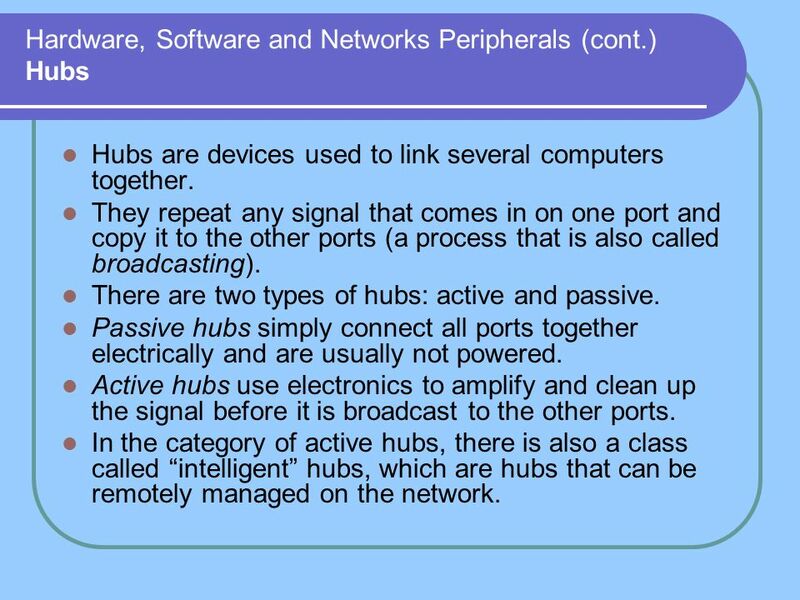 In the category of active hubs, there is also a class called “intelligent” hubs, which are hubs that can be remotely managed on the network. 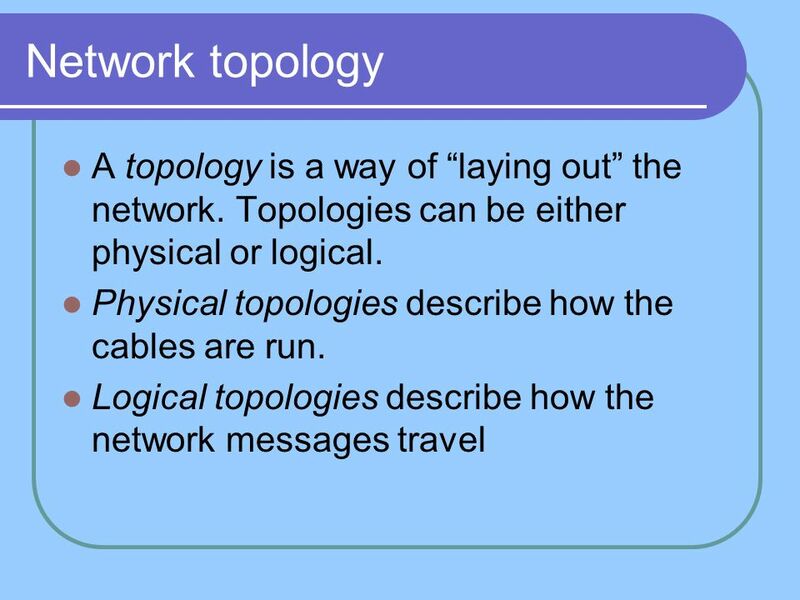 They join similar topologies and are used to divide network segments. For example, with 200 people on one Ethernet segment, the performance will be mediocre, because of the design of Ethernet and the number of workstations that are fighting to transmit. If you divide the segment into two segments of 100 workstations each, the traffic will be much lower on either side and performance will increase. If it is aware of the destination address, it is able to forward packets; otherwise a bridge will forward the packets to all segments. They are more intelligent than repeaters but are unable to move data across multiple networks simultaneously. Unlike repeaters, bridges can filter out noise. 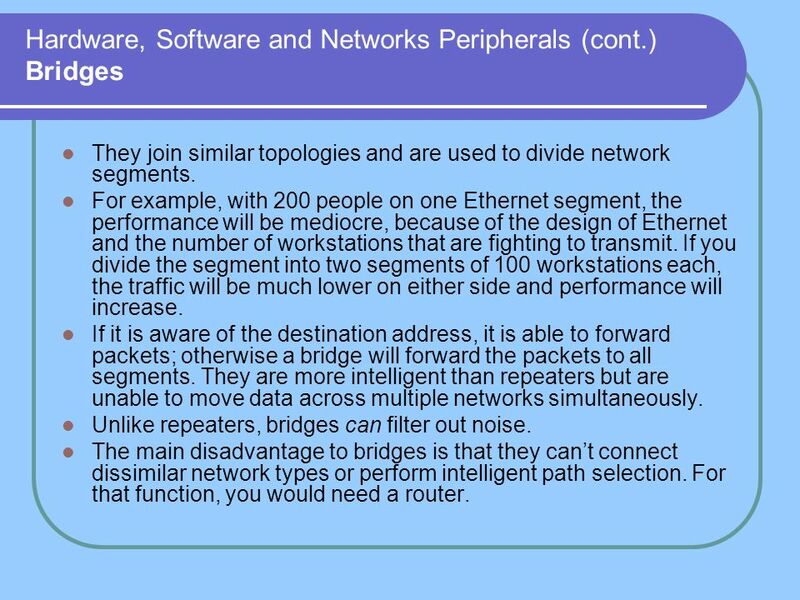 The main disadvantage to bridges is that they can’t connect dissimilar network types or perform intelligent path selection. For that function, you would need a router. Routers are highly intelligent devices that connect multiple network types and determine the best path for sending data. 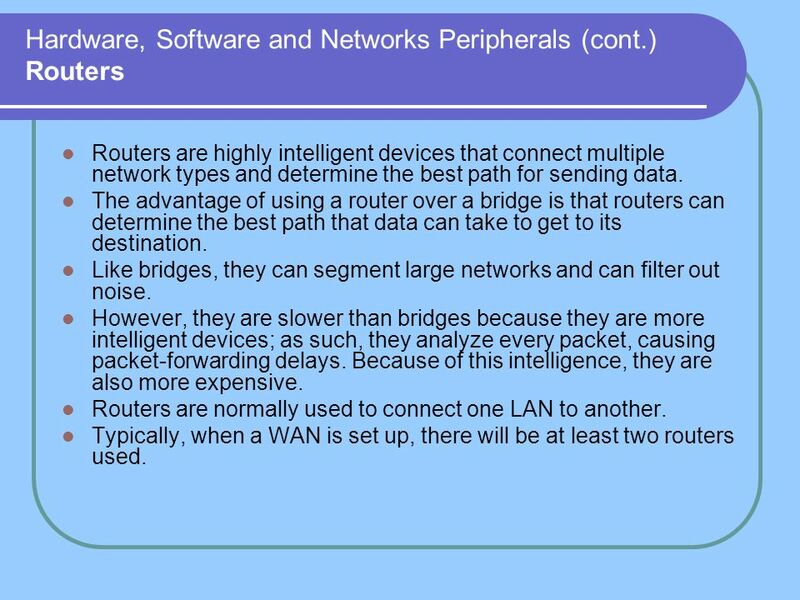 The advantage of using a router over a bridge is that routers can determine the best path that data can take to get to its destination. Like bridges, they can segment large networks and can filter out noise. However, they are slower than bridges because they are more intelligent devices; as such, they analyze every packet, causing packet-forwarding delays. Because of this intelligence, they are also more expensive. Routers are normally used to connect one LAN to another. Typically, when a WAN is set up, there will be at least two routers used. 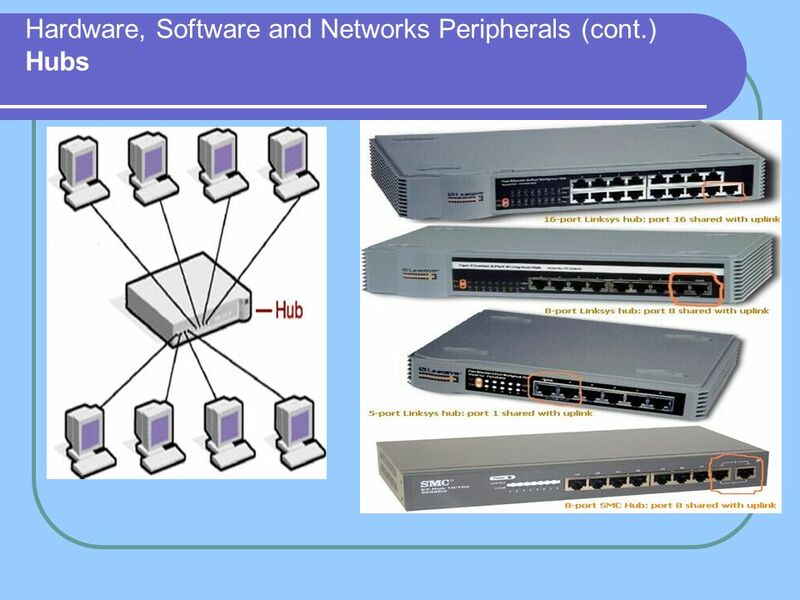 A network switch is a computer networking device that connects network segments. Low-end network switches appear nearly identical to network hubs, but a switch contains more "intelligence" (and a slightly higher price tag) than a network hub. 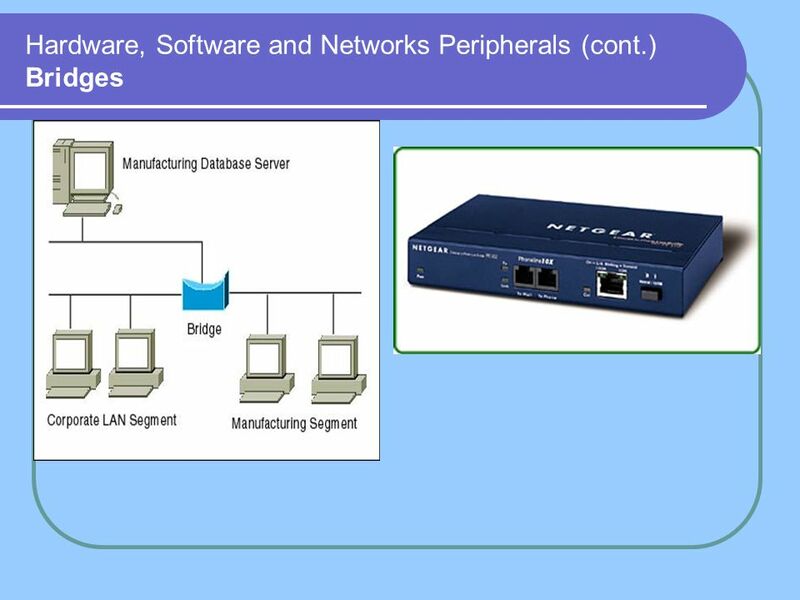 Network switches are capable of inspecting data packets as they are received, determining the source and destination device of that packet, and forwarding it appropriately. By delivering each message only to the connected device it was intended for, a network switch conserves network bandwidth and offers generally better performance than a hub. 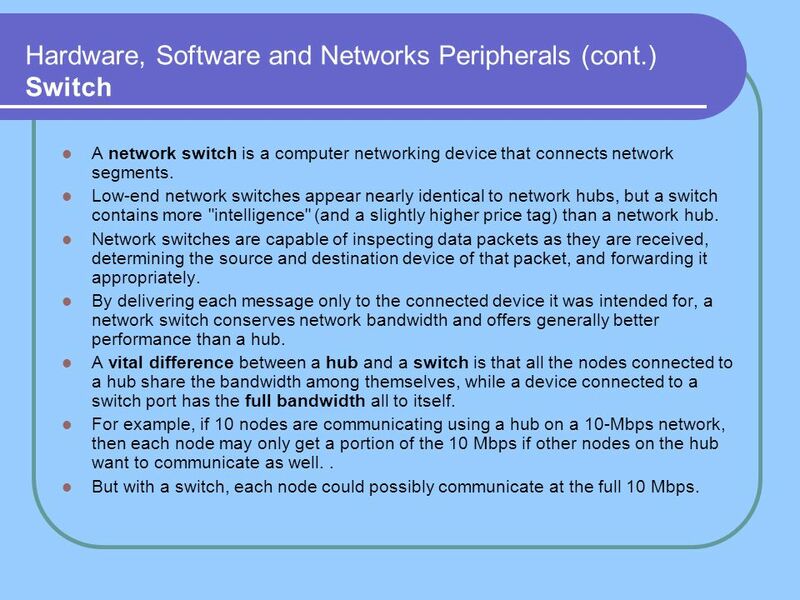 A vital difference between a hub and a switch is that all the nodes connected to a hub share the bandwidth among themselves, while a device connected to a switch port has the full bandwidth all to itself. For example, if 10 nodes are communicating using a hub on a 10-Mbps network, then each node may only get a portion of the 10 Mbps if other nodes on the hub want to communicate as well. . But with a switch, each node could possibly communicate at the full 10 Mbps. 50 LAB1 Connect 2 buildings 3 storey high with a distance of 500m between each building. Each floor is occupied by the Finance Department, Administration Department and Computing Department. Your report should have the following items. Anything extra is encouraged. a. Introduction b. 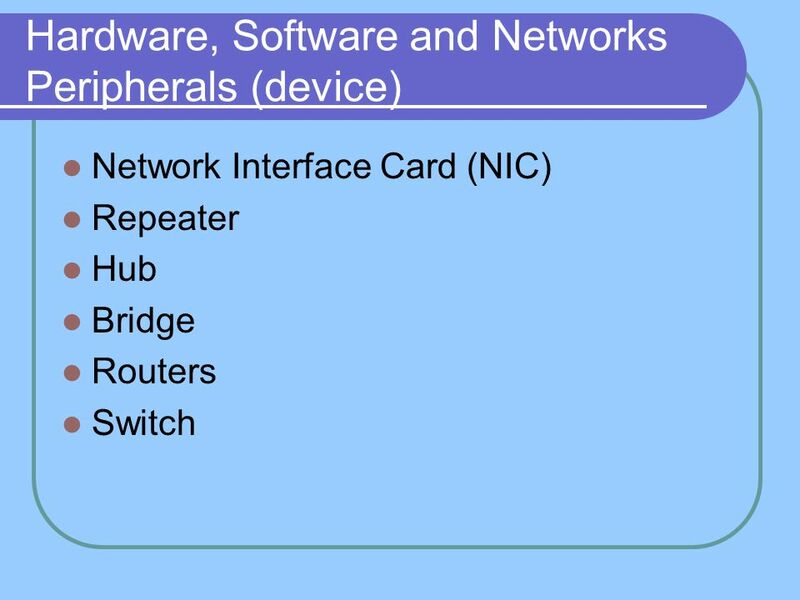 Network Diagrams c. Devices that will be used. 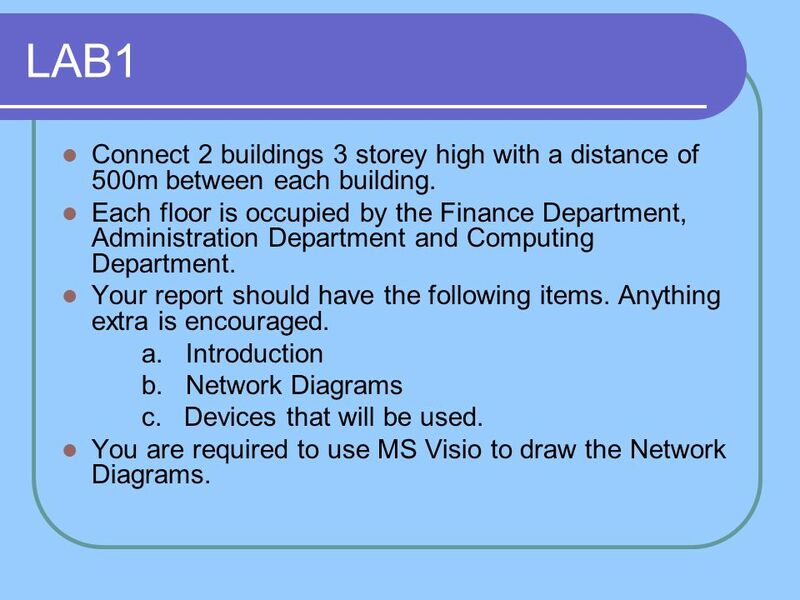 You are required to use MS Visio to draw the Network Diagrams. 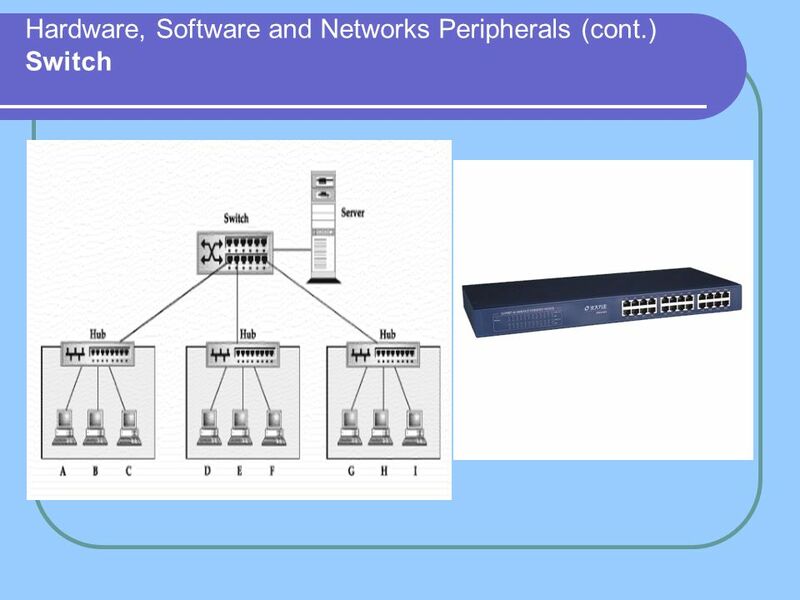 Download ppt "Introduction to computer networking"
INTRODUCTION TO COMPUTER NETWORKS Zeeshan Abbas. 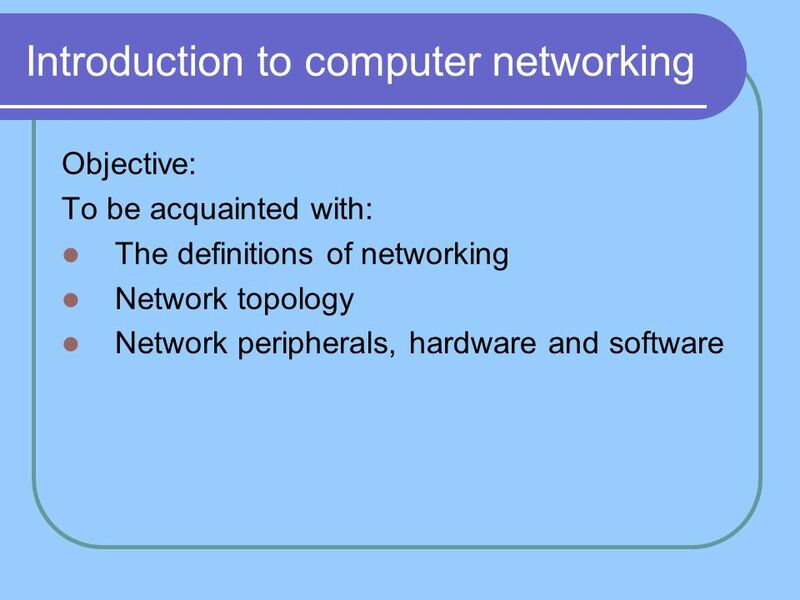 Introduction to Computer Networks INTRODUCTION TO COMPUTER NETWORKS. Shalini Bhavanam. 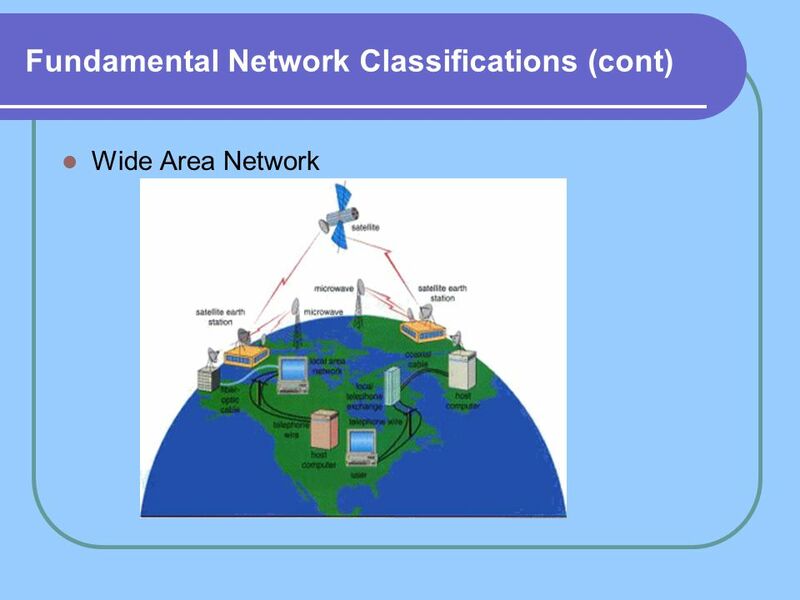 Key words: Basic Definitions Classification of Networks Types of networks Network Topologies Network Models. 1 Fall 2005 Extending LANs Qutaibah Malluhi CSE Department Qatar University Repeaters, Hubs, Bridges, Fiber Modems, and Switches. Computer Networks Eyad Husni Elshami. 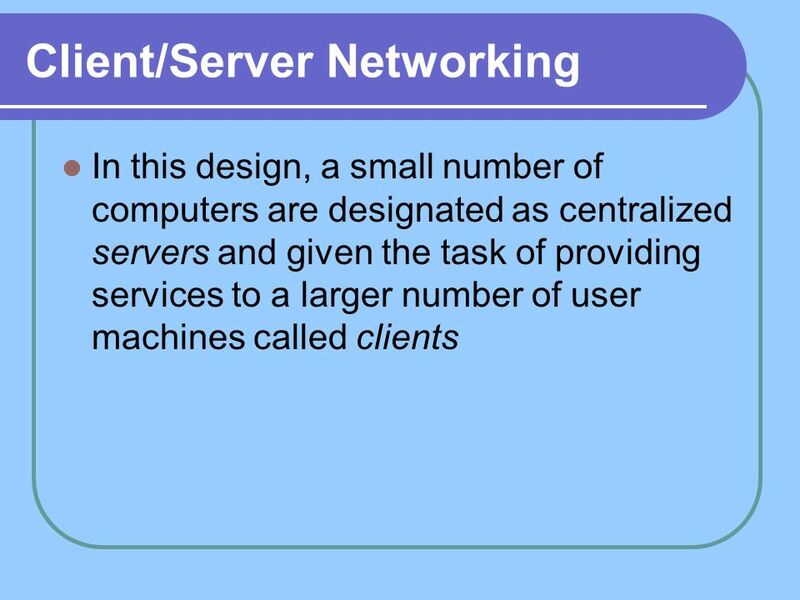 Computer Network A computer network is a group of interconnected computers to share data resources ( printer, data. Copyright©2008 N.AlJaffan®KSU1 Chapter 8 Communications and Networks. 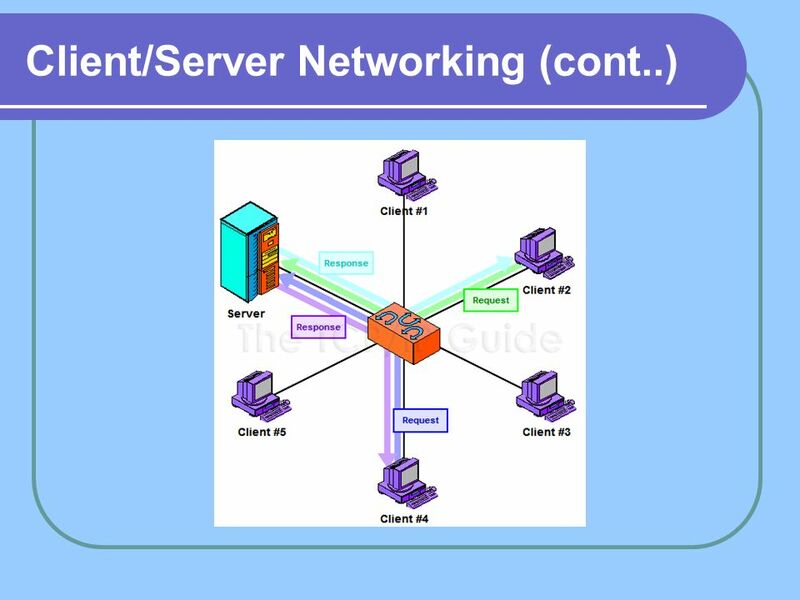 1 25\10\2010 Unit-V Connecting LANs Unit – 5 Connecting DevicesConnecting Devices Backbone NetworksBackbone Networks Virtual LANsVirtual LANs. 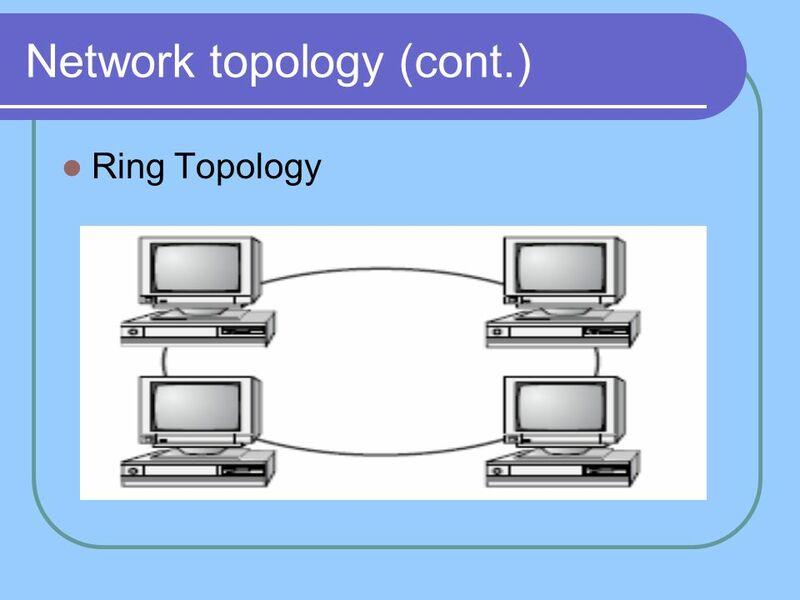 NETWORK TOPOLOGIES There are three basic configurations used to connect computers they are the Bus Ring Star. Computer Networks IGCSE ICT Section 4. Network Hardware for Expanding Network. Expanding Networks When do we need expansion:  Network cable is full of data movements  Printing tasks needs. 1 Network Strategy By Mr J. Sloan. Ideas Protocol WAN LAN Node What is a… Workstation File Server Print Server. Chapter 4.  Understand network connectivity. 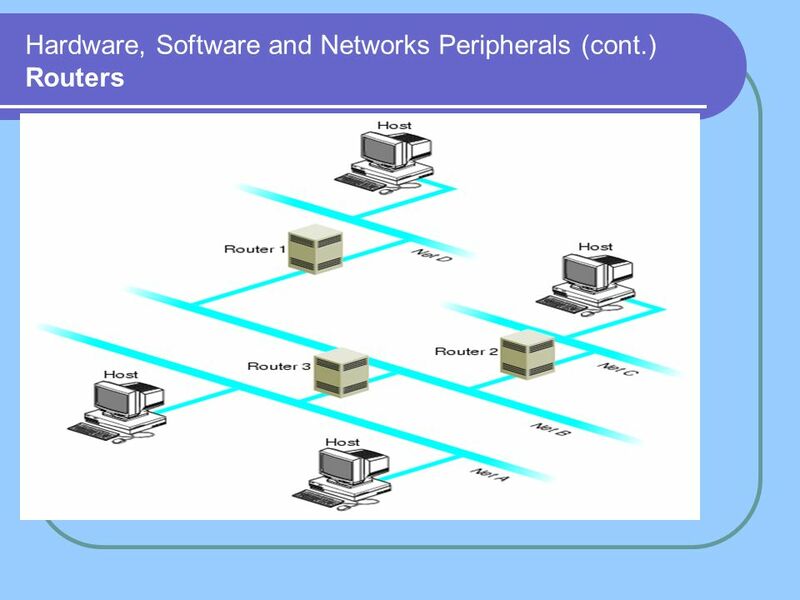  Peer-to-Peer network & Client-Server network  Understand network topology  Star, Bus & Ring topology. Network Design Essentials. Guide to Networking Essentials, Fifth Edition2 Contents 1. 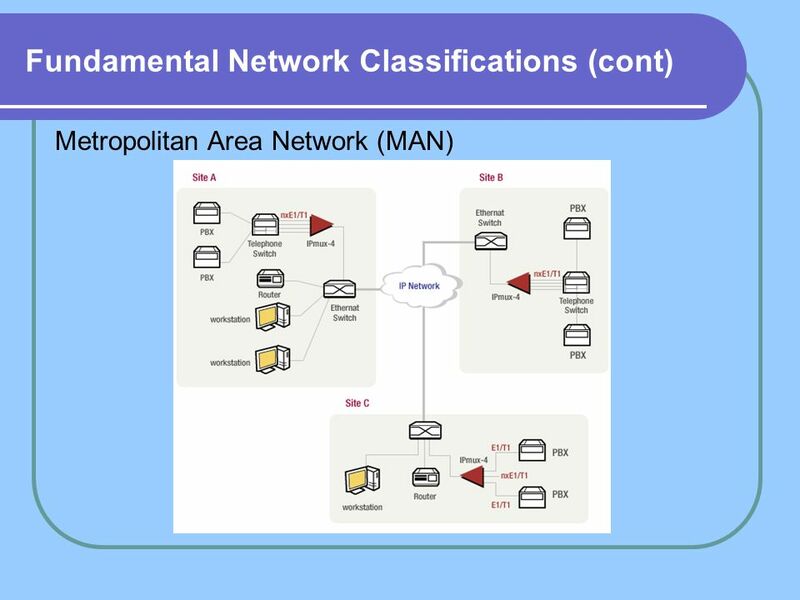 Examining the Basics of a Network Layout 2. Understanding Standard.